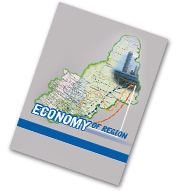 Guide for authors - Main - Journal "Economy of region"
Moderation. After the article has been submitted, it is moderated from the point of view of Journal’s requirements. The Editorial Team return the paper for editing depending on the moderation results. Acceptance. Articles that receive positive reviews are included in the list for publication. At the Editor’s discretion, the articles written in Russian can be published in English. Authors will be informed about this decision in advance, after that they will send the article professionally translated into English.